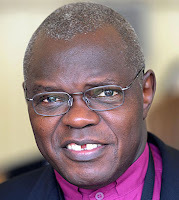 On Monday the Guradian carried an interview with John Sentamu by Stephen Moss. The Archbishop chose to focus on the trust he has set up to help young people in the diocese of York and threatened to cancel the interview the previous day when Stephen said he wanted to talk about schisms in the Church of England, racism, the lack of cohesion in British society, Robert Mugabe and maybe even God. “I have found [LGBT] people will respond,” he said, “if you use a language which is not one of condemnation, which is not one of judgment without understanding, which is non-doctrinaire but actually speaks of love and compassion, of goodness and kindness.” Quite so. “I think that, for a very long time the message has been, ‘Come and see what we can give you,’ instead of: ‘We come to you and together we’ll find out what’s the best way of doing it,’” he admits, “So are we connecting with [LGBT] people? All I can say is this man is trying his best.” If only. If only... If only Archbishop Sentamu were trying his best to respond to LGBT Anglicans not only in England but in places in the Communion where LGBT people are threatened with humiliation, brutality, life imprisonment and death. “I am in a war. It is not my choice. I have not asked for it. Just that I was born at a time and place and of a sexual orientation that is different from the rest of the world. I don’t understand why the enemy fights me. True, I don’t really understand. But, my understanding goes as far as knowing that they really will stop at nothing to win their war. “They say that they love me. So all that they do in the name of their god, they do for love of me. I didn’t ask them for their love. What I see is that I am a fellow human being, a citizen of this earth, but they say they are the inheritors. And they want to drive out all those who are like me, in the name of love and Christ and religion. “They have lots of justifications. I do not claim to understand all their logic, all the long winded arguments. What I understand is that they are persecuting me. And neither Lambeth Palace nor Bishopsthorpe nor 815 will make a public statement condemning the Bill as antithetical to Christian practice and Anglican teaching. I will write more about this in the next post. My partner wanted to apply for the job of Vicar of a York city centre parish, a position for which he had excellent experience. He was told by a diocesan offical that there was no point in him applying because he is gay. Sickening. (Posted anonymously as my partner is still searching for a job). talking to John personally has a very different response, I felt he was open to hearing though not ready to move on the question while someone is able to listen they may shift in little ways. I found him very , very supportive on a personal level, but not ready to move on a public one. "I found him very , very supportive on a personal level, but not ready to move on a public one." Or to put it another way, he's a hypocrite. It comes to something when a Christian person has to oppose killing people in private because they believe it compromises them if they do so in public! By his silence Sentamu offers a terrible message to LGBT people. Whether intended or not they are bound to draw rejection, and tacit support for the Ugandan fascists. If he cannot be moved to speak he should disrobe immediately (not just his dog-collar stunt re. Mugabe) and step down from his exalted hypocrisy.